Jul. 11, 2013 4:00 p.m. Chair WCTS, Mark McFaul, County Councillors Brenda Shantz and Terry Van De Kraats with ‘The Big Cheque’ are all smiles! The groups that benefit directly from the Wetaskiwin transportation system are seniors and people with special needs and indirectly, their families/caregivers. 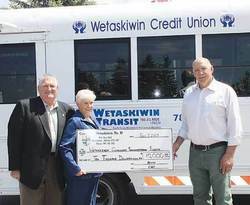 The County of Wetaskiwin recognizing the value of having an effective transportation system invested $10,000 in the Wetaskiwin Community Transportation Society to assist with ensuring subsidizing travel is available to those who require it. County resident’s access to WCTS handi vans explained by King. “The main county residents we cater to are those who live in the divisions bordering the City. That said, we have gone as far as past Highway 2 and currently have a regular client who lives just before Highway 2. To access Wetaskiwin Transit all they have to do is make sure they have registered and paid their annual membership fee, (just like City users), and then call dispatch at 780-312-7433, 48 business hours before their trip to make a booking.